Church Street to open only in December? The granite cobblestones are being laid in a Kasuti pattern as a nod to Karnataka's cultural heritage. 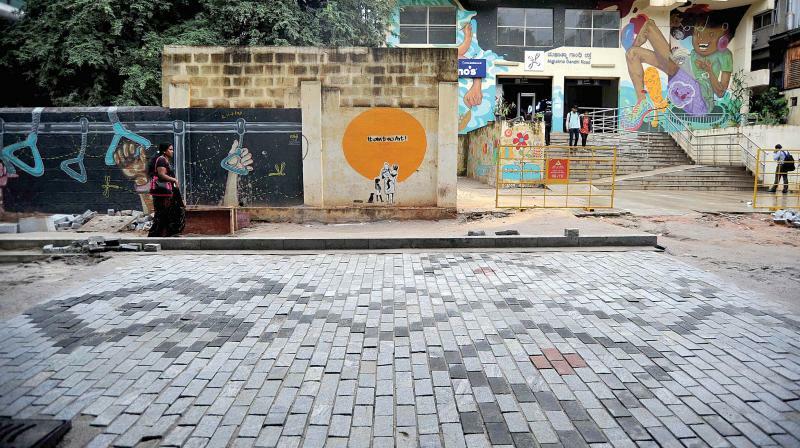 Bengaluru: Church Street, which will be ready for public use by December this year, is already making history here in Bengaluru with its cobblestone path and emphasis on pedestrian priority. The road, however, is only likely to be ready in the first week of December. A number of delays in the project attracted the ire of Chief Minister Siddaramaiah, who directed officials to complete work and open the road to the public on Rajyotsava Day – November 1, although this deadline is likely to be missed too. “This is the first time cobblestones are being used on a main carriage way," said the K.T. Nagaraj, Chief Engineer, BBMP. “It is a laborious process and workers have been spending many hours to lay them. The work would have been complete a long time ago had we used a simple white topping." The granite cobblestones are being laid in a Kasuti pattern as a nod to Karnataka's cultural heritage. The granular base is prepared and the wet mechadam mix laid atop it. "After this paving, a layer of quality concrete is used and the granite cobbles are placed according to the design," Nagaraj explained. 450 metres of the 750 metre stretch are complete, he added. The remodeling of Church Street under TenderSURE commenced in February at a cost of Rs 9 crore. The project was initially expected to be completed by July, after which the deadline was extended to August. However, with the laying of the cobblestones well under way, officials are confident of completing the work by the first week of December. In a first of its kind move, the BBMP is contemplating a weekend ban on vehicular movement on Church Street, which is celebrated for its restaurants, eateries, culture and nightlife. "This is common in many European countries; roads are closed to traffic and opened up instead to live music, street food and cultural activities," said K.T. Nagaraj. "The BBMP is planning the same thing here but we have to get permission from the Traffic police, who have to find alternative routes if they are to divert traffic on Church Street. If they give the nod, Church Street will be closed to traffic on weekends and pedestrians are free to stroll down it at their leisure."